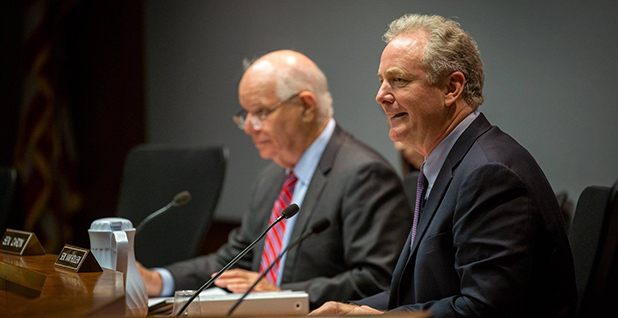 Sen. Chris Van Hollen likes the Green New Deal and plans to soon support its ambitious vision of fighting climate change. But first, the Maryland Democrat has to get a couple of things in order — such as finishing up a related measure that would impose a price on carbon emissions. "I intend to co-sponsor the bill in the coming weeks when I also introduce 'cap and dividend' legislation," wrote Van Hollen in a Twitter post earlier this month. His conditional support is emblematic of where things stand in the ongoing effort by environmental activists to recruit more congressional co-sponsors for a symbolic resolution in support of the Green New Deal. With the low-hanging fruit of early admirers now plucked, all that remains are the tougher branches. And with that comes some politicking and conditions — such as Van Hollen's ancillary push for a carbon price — that could foreshadow a legislative battle over the Green New Deal and its transformational plan to fight climate change with a government-led jobs program. "I felt it was important to couple my support for the Green New Deal — which puts forward a plan for investment in green jobs and renewable energy — with my legislation to significantly reduce carbon pollution by putting a price on emissions. Both pieces are necessary to tackle this crisis," Van Hollen said in a statement to E&E News. On one level, it isn't a surprise that Green New Deal supporters have struggled to add co-sponsors over the last couple of weeks. Most bills or resolutions experience a dip in enthusiasm a few weeks after their introduction, and the same pattern would fit the Green New Deal. The resolution was introduced Feb. 7 with the backing of about 80 co-sponsors in the House and Senate; since then, about two dozen backers have come on board. The most recent, Rep. Dutch Ruppersberger (D-Md. ), signed up March 8, according to congressional records. Because of the slowdown, the current moment offers an inflection point for the Green New Deal resolution — if not the movement overall. Legislatively, momentum has stalled. The number of new co-sponsors has slowed to a trickle, and its prospects of passage — never good or realistic to begin with — have hit separate roadblocks in the House and Senate. On the House side, Speaker Nancy Pelosi has spoken positively about the enthusiasm of Green New Deal supporters, but the California Democrat hasn't committed to holding a vote on the measure. "I can't say we're going to take that and pass it because we have to go through our checks and balances of it with our committee chairs and the rest," Pelosi said in late February. The situation is almost the exact opposite in the Senate. Majority Leader Mitch McConnell (R-Ky.) plans to hold a vote soon on the Green New Deal resolution, but his aim is to put political pressure on moderate Democrats rather than build support for the idea. In response, Senate Democrats have discussed the idea of voting "present" — rather than yes or no (Climatewire, Feb. 26). The upcoming vote, and the Democratic countermeasure, could explain why other Senate Democrats have been reluctant to join as co-sponsors, as it might look strange for a lawmaker to sign up as a supporter and then vote present a few days later. McConnell's move has pushed some Democrats who haven't co-sponsored the Green New Deal into defending it. Two of the Senate's loudest climate hawks, Sens. Brian Schatz of Hawaii and Sheldon Whitehouse of Rhode Island, are conspicuously absent from the Green New Deal resolution. They have praised it but also emphasized their own climate proposals (E&E Daily, Feb. 6). With the Senate vote looming, however, those two have leaned into the fight. Whitehouse has used his regular climate-themed floor speeches to highlight polling that shows Republican voters support the Green New Deal's principles. And Schatz has folded the proposal into his attacks on the GOP. "If you are undecided on the Green New Deal one data point is that Jack Abramoff has started a super PAC against it," Schatz tweeted of the notorious Republican lobbyist who pleaded guilty in a 2006 case that alleged widespread corruption. There have been other issues, too — notably a high-profile dust-up last month between Sen. Dianne Feinstein (D-Calif.) and Green New Deal supporters. The activists were trying to convince Feinstein to support the resolution, and her response — captured on video — was criticized as condescending by its supporters. "You know better than I do, so I think one day you should run for the Senate, and then you do it your way," Feinstein told one protester (Climatewire, Feb. 25). The lack of movement in Congress, however, belies a different kind of momentum for the Green New Deal. The proposal is a frequent talking point on the 2020 campaign trail — at least a half-dozen presidential aspirants are co-sponsors. One of the campaign's newest entrants, former Rep. Beto O'Rourke (D-Texas), spoke positively of the concept at a campaign stop last week. "I'll tell you what. I haven't seen anything better that addresses this singular crisis that we face, a crisis that could, at its worst, lead to extinction," he said. Climate ranks as the top issue for Iowa Democrats, statistically tied with health care as the topic they most want candidates to talk about, according to a CNN/Des Moines Register poll conducted in early March. A whopping 91 percent of Iowa Democrats told the pollsters they preferred a candidate who backs the Green New Deal. In recent weeks, supporters of the Green New Deal have worked a dual track to build support for the concept. They've pushed the Democratic presidential field to embrace the Green New Deal while encouraging other members of Congress to get on board. One new campaign tries to do both. Activists with the Sunrise Movement, the group that launched the Green New Deal discussion, plan to fan across the country for an event that's being billed as the Road to a Green New Deal Tour. "Starting in mid-April, thousands will gather for nine massive events with national Sunrise leaders and some of the rising stars in progressive politics," Varshini Prakash, the group's executive director, wrote in a recent email call to arms. "Planning is already in full swing for stops in Boston, Detroit, Des Moines, Paradise, CA, Los Angeles, San Antonio, New Orleans, Richmond, KY, and Washington, DC." The effort will entail more than 100 town halls, as well, according to organizers. "If we pull this off, we'll build the public support needed to ensure that the Green New Deal is at the top of the agenda as we head the 2020 election," Prakash added. Already there are signs that some folks are listening. Ruppersberger, the Maryland congressman, is the most recent signatory to the Green New Deal resolution. Not known as a liberal bomb-thrower, the nine-term lawmaker represents a Maryland district that's home to Fort Meade and the National Security Agency. He's served on some of Congress' most established panels — including his current stint on the Appropriations Committee — and Ruppersberger told E&E News he was initially skeptical of the whole thing. "At first blush, I was thinking I wasn't going to get involved with that," said Ruppersberger in a phone interview. Part of his concern with the Green New Deal was that it would be a "Bernie [Sanders] issue," he said — in other words, a long wish list without a price tag. And indeed Ruppersberger said he still nurses some of those concerns. "I reserve the right to evaluate every issue as it comes," he said. But Ruppersberger said two factors swayed him. The first was a strong argument in favor of the Green New Deal by Rep. John Sarbanes, a fellow Maryland Democrat. The other was taking the time to read the resolution, which calls for massive transformation of U.S. industries, including a 10-year goal of generating "100 percent of the power demand in the United States through clean, renewable, and zero-emission energy sources." "There's nothing in there we don't want for our country," Ruppersberger said. At the very least, he added, the Green New Deal "allows us to start debating these issues."